Salutations from the great state of New Jersey! It’s Andy Gesner and the dedicated staff from HIP Video Promo, here with a clip from a young British star who’ll soon be replicating his European success in America. Ray Davies, Ian Dury, Jarvis Cocker, Mike Skinner, Alex Turner. 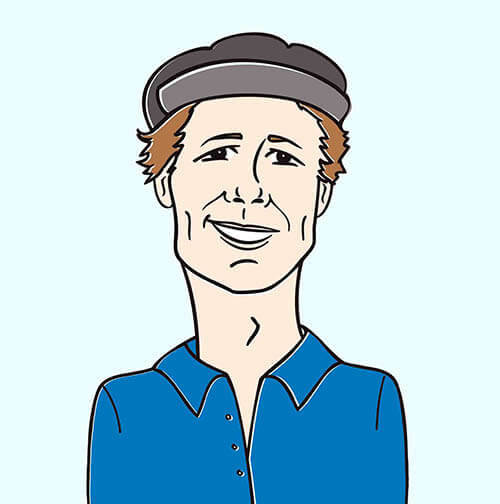 To that list of great English storytellers, you can append the name Jamie Treays – or, as he’s better-known, Jamie T. Most statesiders aren’t hip to him yet, but it’s only a matter of time: in the U.K., he’s stormed from obscurity to the pop charts in a matter of months, and the U.S. release of Panic Prevention, his revelatory debut, is happening this September. Zane Lowe, Britain’s most influential deejay, loves him. Lily Allen is a fan; she’s already appeared on a remix of one of his songs (the US bonus track “Rawhide”). Jamie T has ridden three singles into the U.K. Top 20, and Panic Prevention hit #4 on the album charts. He took home the Best New Artist trophy at the NME Awards this year, and best of all,Panic Prevention has been shortlisted for the Mercury Prize. Why has Jamie T’s ascent been so steep? Start with his delivery – conversational, instantly identifiable, smart without resorting to cleverness, tough without being brutal. Like Skinner of The Streets, Treays seems to speak for disaffected working-class youth, but he’s the possessor of a skewed, fatalistic, and darkly humorous perspective all his own. Then, there’s his bass playing, which anchors his grime and rap-influenced music in the rock tradition; it’s unstudied, sure, but it’s aggressive and melodic, and Treays coaxes a tone from the instrument that scratches a very deep itch. Finally, his pop smarts are unquestionable: his songs invariably feature big, infectious beats, and a madly-catchy chorus. Take, for example, “Sheila”, his first U.S. single, and a song with a hook massive enough to hoist it up the British charts not once but twice over the past year. But irresistible though it is, “Sheila”, like most Jamie T numbers, is deadly serious and often downright moving. Here’s the tough, articulate urban realism that Treays has become known for – it begins with a story of the drowning of a drunk woman, segues into a tale of a drug dealer on the run, and culminates in a late-night shooting. 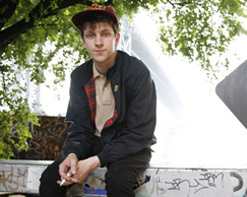 Jamie T delivers his stories with empathy and understanding, but there’s a trace of criticism in his young voice, too. Just like the aforementioned giants whose shoulders he gratefully stands on, his social observations, however witty, are awfully poignant. The clip for “Sheila” is strangely moving, too – especially considering the fact that it stars a pair of baboons. The two trained monkeys turn in remarkable performances as a typical suburban couple living together in an entirely ordinary city apartment. We know one is male and the other is female because of their color-coded keychains; when the “man” grabs his briefcase and heads for work in the morning, he takes the blue ring off of its hanging and leaves the pink one there for his mate. She pushes a vacuum cleaner and cleans up after him – but mostly she waits for him to return. When he does, he puts his arm around her and watches the telly, but he also hits the bottle hard. As the days flip by, the male baboon’s drinking gets harder and harder, and often the blue keychain is missing from the wall hangings for nights at a time. The sadness of the female baboon is startlingly rendered; some of the shots of the neglected wife, staring out the window, are positively heartbreaking. Finally, she has enough of him – gathering her courage, she packs and marches out, leaving him alone to tear up the flat. Caroline Records does it again, and we want to thank them for all of their hard work and cooperation in getting us everything we need to make sure you embrace Jamie T like we have! We’ll have lots of copies Jamie T’s new record Panic Prevention available for all of your on-air giveaway needs and to coincide with his upcoming US dates. Get in touch if you’d like to get in on either one! If you need more info, call Andy Gesner at 732-613-1779 or e-mail us at info@HIPVideoPromo.com . You can also visit www.Caroline.com, or www.Jamie-T.com to find out more about Jamie T.